What to know: From the Netherlands, an uncanny story about a young girl struggling with the death of her mother. How hard it is to lose a parent as a young child? I felt an immediate sense of sympathy for this young girl, Eve. She clearly has a lot to say to her dead mom and she finds a very sweet way to communicate with her. It's a little hard to believe that a dying mom would have the foresight or the energy to make a separate videotape for every one of her daughter's upcoming birthdays. Her father, Kaspar (Erik van Welzen) displays quite a bit of annoyance with Eve over some of her actions and she seems to enjoy defying her dad's wishes. He apparently would like to forget about his deceased wife and focus on his new, pregnant wife. The director brings out the mixed emotions of this family. In this subtitled film from the Netherlands, 11-year old Eve (Suus Ordelman) has a rather expressionless face as she views her deceased mother on the videotape. She just smiles and tears up briefly as she watches and listens to her mom speak. Have her emotions been numbed by the early loss of her mother? There are some interesting close-up camera views of Eve's secret stash of personal items stored on her video camera. Some of these scenes presumably would be included in the movie she's making for her mom. There is a creepy use of lighting from her flashlight while Eve visits her mom's gravesite at night. My favorite part of this film is when Eve's pet dog helps her unwrap her birthday presents. The message is that just because someone you love has died, they do not have to be gone from your life. That someone will always be watching over you. I give this film 5 out of 5 stars and recommend it for ages 8 to 18, as well as adults. Recommended for the KIDS FIRST! Film Festival, especially for tweens and teens. 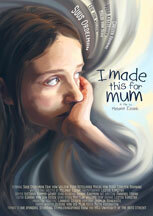 Anyone who has lost a parent will particularly resonate with this film. Reviewed by Jeff M., KIDS FIRST! Adult Juror. Eve (age 11) was only four years old when she lost her mother to breast cancer. She still struggles with this, even though back then she wasn't even old enough to understand what was happening. That's because Eve receives videos from her mum every year on her birthday. In those videos her mother tells her about the life she lived before she passed away. Slowly Eve gets to know a mother she'll never meet again. That's really hard for her, because it raises a lot of questions which she can't ask anyone about. Her father repressed his mourning a long time ago and it sometimes seems that he doesn't even recognize his daughter could be sad too. That's why Eve tries to connect with her past through making something. She starts a film project for the mother she never got to know.